From this point on we are presuming that you have followed our guidance in the previous post on treating your deck when it is new. Assuming that your deck has now either weathered with Seasonite for its first 6-12 months or that it has been untreated until now, you should follow our simple steps to having a finished and wonderfully protected deck. If your deck has been finished in the past but the coating is damaged or faded then read on too for information on how to get it ready for a new finish. Whatever your chosen style of finish, you can find a guide to achieving your look here! If your deck has only been treated with Seasonite or has never been treated before it is very simple to prepare the surface for your chosen finish. You need to use a wood cleaning product to remove any built up dirt and grease which will prevent your chosen finish from penetrating the wood correctly. We would recommend Owatrol’s Net-Trol wood cleaner and color restorer which means that as well as removing any built up dirt and grease, it will also restore the wood from grey to its natural new color. Net-Trol is so easy to use! 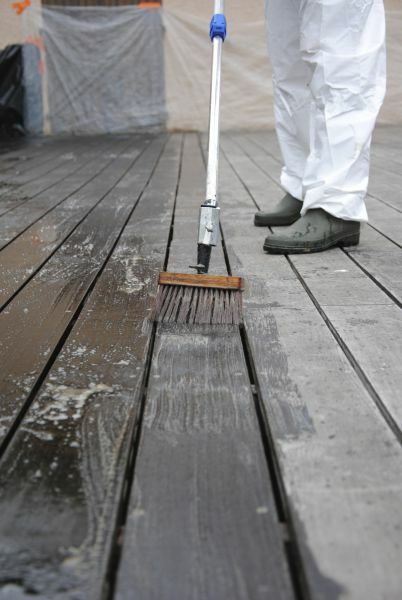 First wet the surface of the deck and then apply the Net-Trol with a brush or roller. Leave it to work for approximately 20 minutes and then scrub the surface whilst rinsing with water. Use the highest power source you have available (a pressure washer is ideal but a garden hose would suffice). You then need to leave it to dry for at least 48 hours before applying a finish. What if my deck has been finished before? 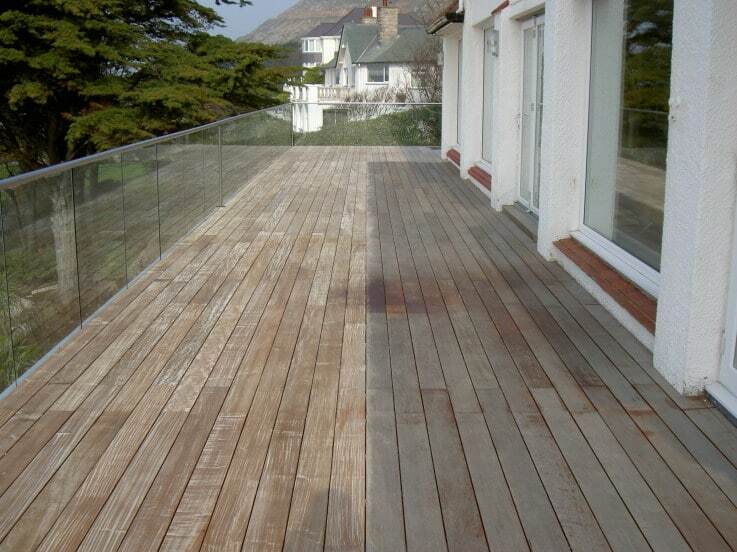 If your deck has previously been stained, painted, oiled or varnished then you will need to strip the previous coatings. 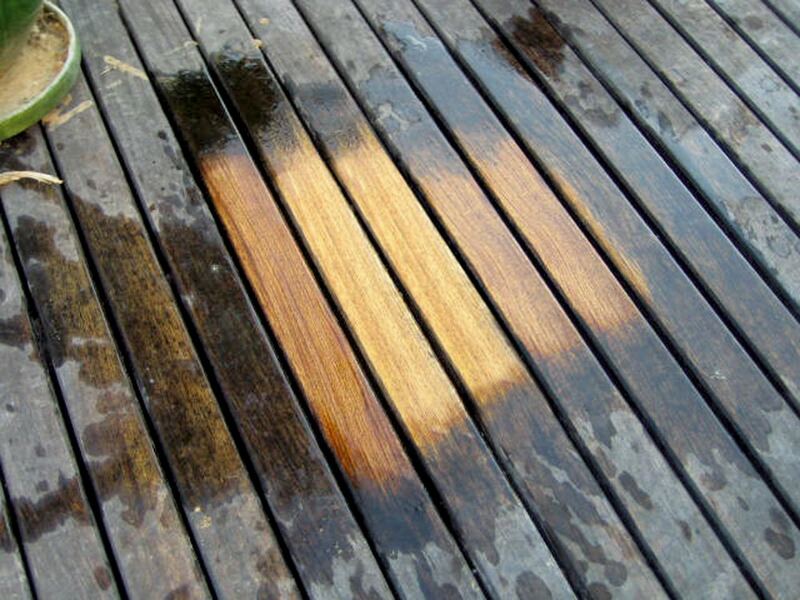 Aquanett is our solvent-free wood oil remover and will easily remove teak and other oils from your decking (please note you can only use Aquanett to remove wood oils – not paint, varnish, stains etc.). To use, simply apply a generous coat, leave for 5 minutes and then apply a second coat on top. You then leave this for 15-20 minutes before rinsing with the highest powered water source you have whilst scrubbing. For a video demonstration of how to apply Aquanett please see our product page. Prepdeck is our professional grade wood stripper which also serves as a remover for mill glaze and timber grade stamps. To use it to clean your deck you should work in areas which can be completed in 15-30 minutes. First apply Prepdeck to the area to be treated and allow it to work. Test a small area with a nylon scrubbing brush to see if all previous coatings have been removed. If they have, continue to scrub the area whilst rinsing with plenty of water. Alternatively, use a pressure washer always working in the direction of the grain. Finally rinse with copious amounts of water. This is a good option if you think you have many layers to remove or your deck is particularly dirty as it’s a powerful stripper and cleaner. What do I do once I’ve stripped my deck? Once you have used a stripping product such as those offered by Owatrol it is important to use a wood cleaner such as Net-Trol to neutralise the surface of the wood and prevent your stripper from remaining active on the surface and eating into any future finish you apply. 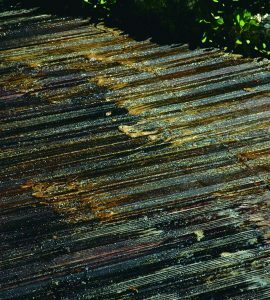 You can use Net-Trol in the same way as explained above for untreated weathered wood. Then simply leave the deck to dry for at least 48 hours before applying your chosen finish. Now your deck is ready to be transformed with your chosen finish!